On today’s episode of One Cross Radio, we are joined by our amazing friend Jen Percy from Cardboard Koinonia, and we’re talking about Anxiety. Jen is someone I deeply admire and have had the chance to grow as friends and serve in ministry with over the years – but anxiety is something we’ve both had to deal with, and since many others do as well – we thought it would be good to talk about. 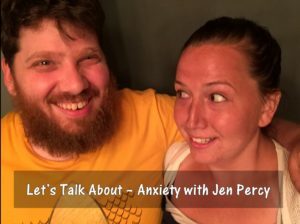 Jen and I share some of our experiences with anxiety, as well as how we cope, and try to get out of the episodes when they happen. As mentioned im the episode, Jen has a Scentsy store which you can check out at here. She is also one half of the awesome Cardboard Koinonia team, which you can check out at here (or on their facebook, instagram, or youtube channel). And if you can, check out our Kofi page by hitting up the button at the bottom of the page. And as always, don’t forget to; like, share, and subscribe if you can! I hope and pray you found today’s episode helpful, especially if you struggle with anxiety. What are some of the ways you cope with anxiety? What are some scriptures you go to for comfort? Let us know in the comments! Hope you enjoyed today’s episode and that you have a wonderful week! God bless my friends!